Iraqi documents collected by U.S. intelligence during the Iraq war and released by the Bush administration show Saddam Hussein's regime was monitoring reports that Iraqis and Saudis were heading to Afghanistan after the Sept. 11 attacks to fight U.S. troops. The documents, the first of thousands expected to be declassified over the next several months, were released late Wednesday via a Pentagon Web site at the direction of National Intelligence Director John Negroponte. Many were in Arabic — with no English translation — including one the administration said showed that Iraqi intelligence officials suspected al Qaeda members were inside Iraq in 2002. The Pentagon Web site described that document this way: "2002 Iraqi Intelligence Correspondence concerning the presence of al Qaeda Members in Iraq. Correspondence between IRS members on a suspicion, later confirmed, of the presence of an Al-Qaeda terrorist group. Moreover, it includes photos and names." Some of the documents seem innocuous: one flier, in Arabic, is addressed to Arab immigrants and contains Islamic Emirate officials' names to assist immigrants. The documents include more daunting reads, such as a 32-page translation of the al Qaeda bylaws. Read a Pentagon translation of the al Qaeda bylaws. Read a translated bio of Ayman Al-Zawahiri. Check out more declassified documents on the Pentagon Web site. 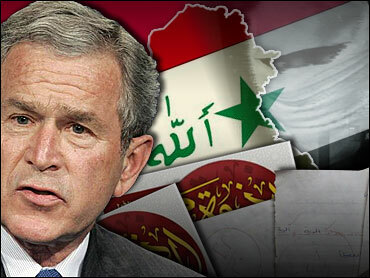 The release of the documents, expected to continue for months, is designed to allow lawmakers and the public to investigate what documents from Saddam's regime claimed about such controversial issues as weapons of mass destruction and al Qaeda in the period before the United States invaded Iraq in March 2003. The Web site cautioned that the U.S. government "has made no determination regarding the authenticity of the documents, validity or factual accuracy of the information contained therein, or the quality of any translations, when available." A handful of prewar Iraq government documents released Wednesday had been translated into English. One, entitled "A short report from the trip to Nairobi," seems to be a letter from Omar al-Sumali, and details his travels to Kenya and Somalia in hopes of establishing a terrorist camp in the region. "Give this locality a chance by supporting it financially and supplying good personnel. The potential is very good. We should move very quickly, and seize this opportunity for Jihad," the letter reads. They included one Iraqi intelligence document indicating Saddam's feared Fedayeen paramilitary forces were investigating rumors in the fall of 2001 that as many as 3,000 Iraqis and Saudis were going to fight in Afghanistan after the U.S. invasion. "In the report on the status of rumors for November of 2001 regarding Fedayeen Saddam in al-Anbar, there is an entry that indicates that there is a group of Iraqi and Saudi Arabians numbering around 3,000 who have gone in an unofficial capacity to Afghanistan and have joined the mujahidin (mujahedeen, or holy warriors) to fight with and aid them in defeating the American Zionist Imperialist attack," the translated document stated. "After presenting the matter to the Supervisor of Fedayeen Saddam, he ordered that the matter should be looked into for verification of the truth of the rumor," the translation said. House Intelligence Chairman Peter Hoekstra, R-Mich., requested the release of millions pages of documents and audio recordings captured during current and previous U.S. military operations in Iraq. Most have sat untranslated for years. Last weekend, Negroponte agreed to set aside money and establish a system to make the documents available to the media, academics and other researchers. In a statement, Hoekstra welcomed the chance to answer questions about prewar Iraq. "Whether Saddam Hussein destroyed Iraq's weapons of mass destruction or hid or transferred them, the most important thing is we discover the truth of what was happening in the country prior to the war," he said.